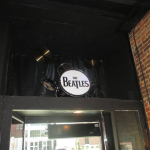 On the following pages, you'll find restaurants in Greenville Ky, restaurant reviews, attractions, and events. 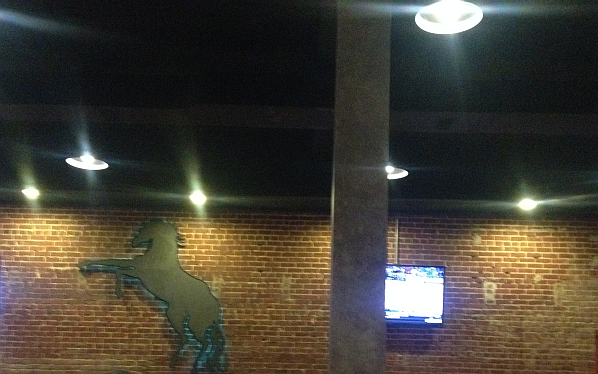 A few nights ago, Michael and I decided to try Mustang Grill and Steakhouse in Greenville. 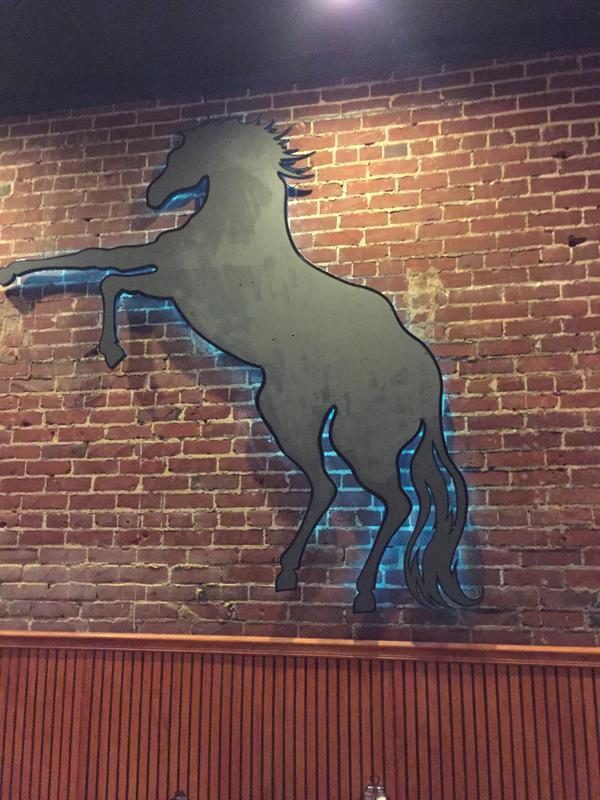 We’d heard great things about this restaurant and wanted to try it out for ourselves. I tried to Google the restaurant to see if it had a website with a menu. When you have to follow a special diet, it’s best to have a plan going in. Unfortunately, there was no website to speak of, so I had to “wing it.” It’s always disappointing when a restaurant doesn’t have a website and/or a gluten free menu. It makes life tougher for a lot of us. In fact, a lack of an online gluten free menu is costing restaurants more guests than they may realize. 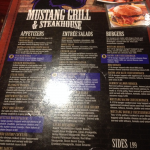 My oldest daughter (Emily) and I usually only go to restaurants with gluten free menus. As I said, however, I was starving my face off and HAD to eat pronto. Fortunately, when we were seated and looked through the menu, I did see several options that I thought looked safe. Again, without a gluten free menu, it leaves you in a pretty vulnerable position, but I’ve learned that sometimes you just have to work with what you have. First, let me say this – the restaurant is beautiful. Everything about it is just gorgeous and it’s a very cool place to be. You know what I mean, right? 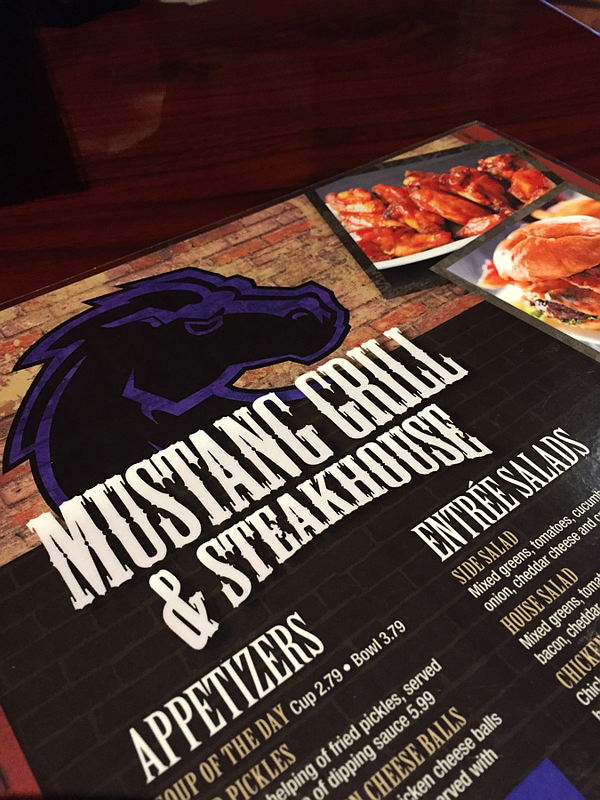 Some restaurants just have a great “vibe.” Mustang Grill and Steakhouse has a killer vibe and tons of large screen tvs that sports fans will love. As one, myself, I definitely enjoyed the basketball that was on. 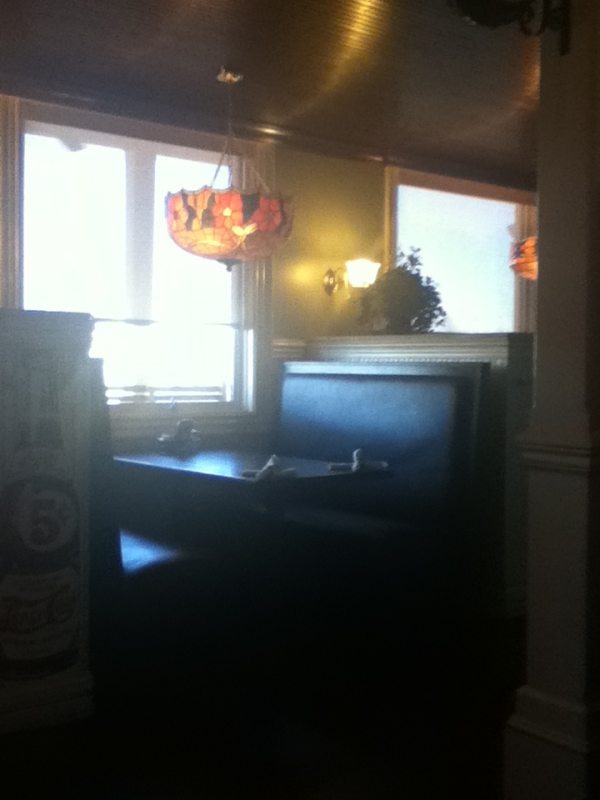 The hostess was very warm and friendly and our server was even friendlier. I don’t recall her name (I’m forgetful when I’m excited by new surroundings) but she had beautiful red hair! Michael ordered a cheeseburger, fries, and coleslaw. 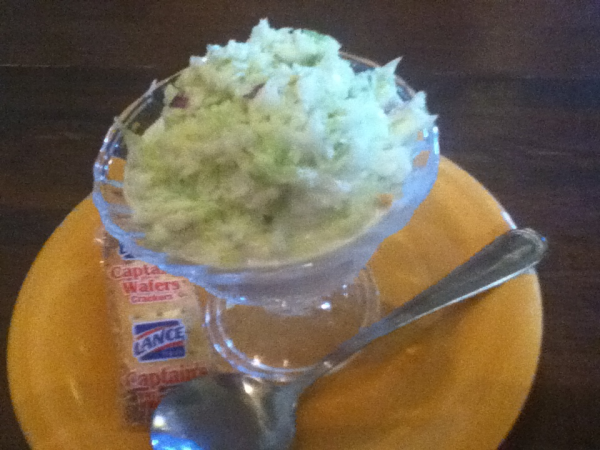 I decided to play it extra safe (because a week-long stomach ache and agony are never fun): I ordered a side salad with French Dressing (no croutons), coleslaw, and an appetizer as my entre – a shrimp cocktail that turned out to be as legendary as Philly’s coleslaw. 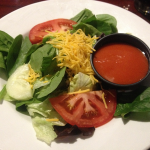 As for a review of the food, let’s take the excellent first: The French Dressing was out of this world. It tasted homemade (by someone who knows what they’re doing) and I thought it was perfect. 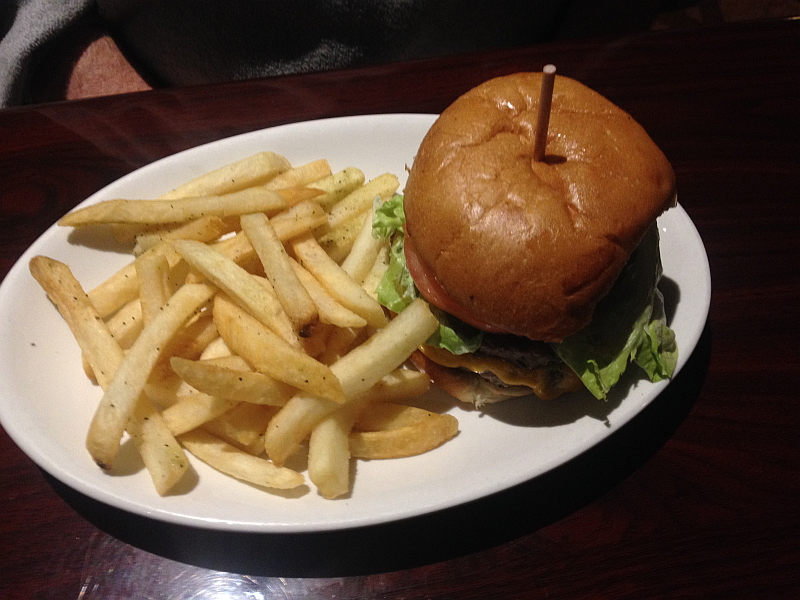 Michael said that his cheeseburger and fries were also excellent. They certainly looked like works of art. The shrimp cocktail was gorgeous (it’s pictured at the top in all its glory) and, as I said, it was the stuff legends are made of. The shrimp were big and beautiful, juicy and delicious. They were some of the biggest shrimp I’ve ever seen in my life and, as a shrimp fanatic, I’ve seen A LOT of shrimp. The cocktail sauce (made “in house”) was fantastic, as well. 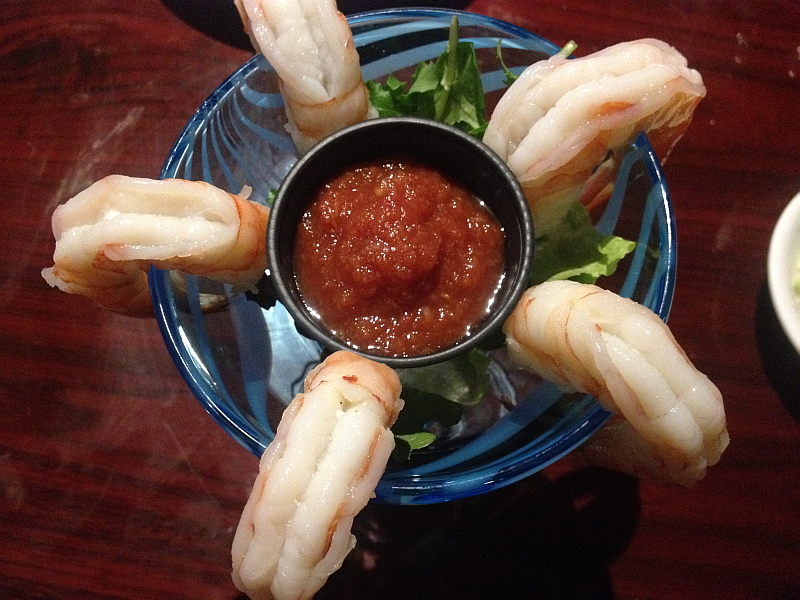 It had a real kick to it – from the horseradish – and any fan of shrimp cocktails would be blown away by it. 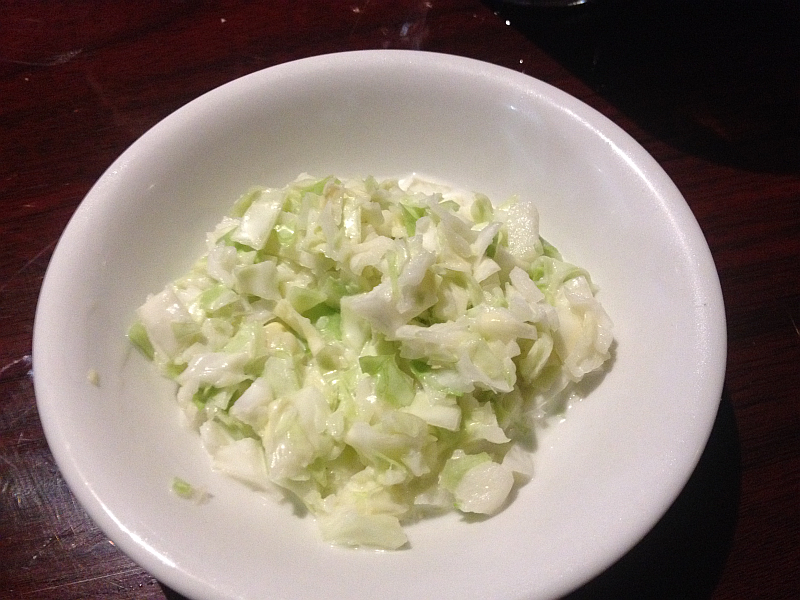 As for the coleslaw, it tasted good… but there was just so darn little of it. There was, literally, just a couple of bites of coleslaw in each of our bowls. When you go, you might want to consider a different side OR order an extra coleslaw! It tastes very good, there just isn’t much of it. 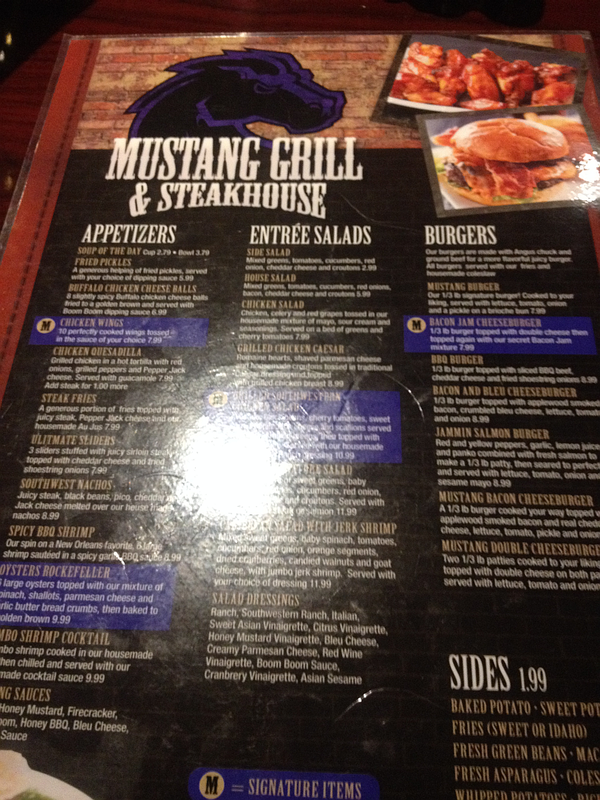 I was really impressed by Mustang Grill and hope that someday there will be a gluten free menu available. 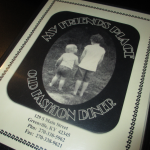 I’d love to go back and try other menu items, but I’d need a gluten free menu in order to do so. 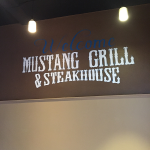 Mustang Grill and Steakhouse has a Facebook page (click the link to check it out). 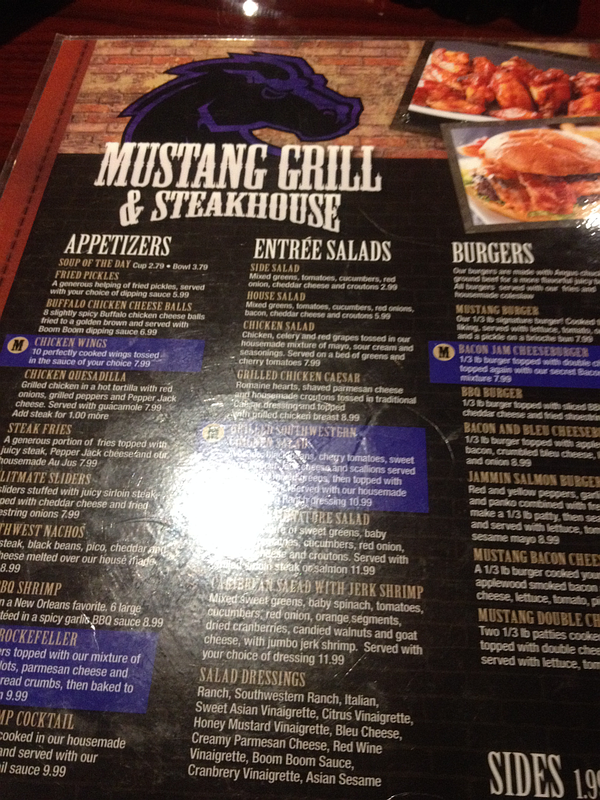 While there isn’t a “list” of menu items, you can find pictures of their menu (front and back) in the photos. You can also find other great pics of their food items. 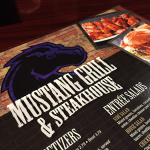 If you don’t have any eating restrictions, I wholeheartedly recommend you try Mustang Grill – you’ll love the atmosphere and the food. 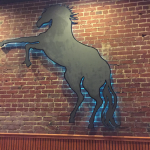 Mustang Grill and Steakhouse is located in downtown Greenville at 107 E Main Cross St. I hope you’ll go as soon as you get a chance. 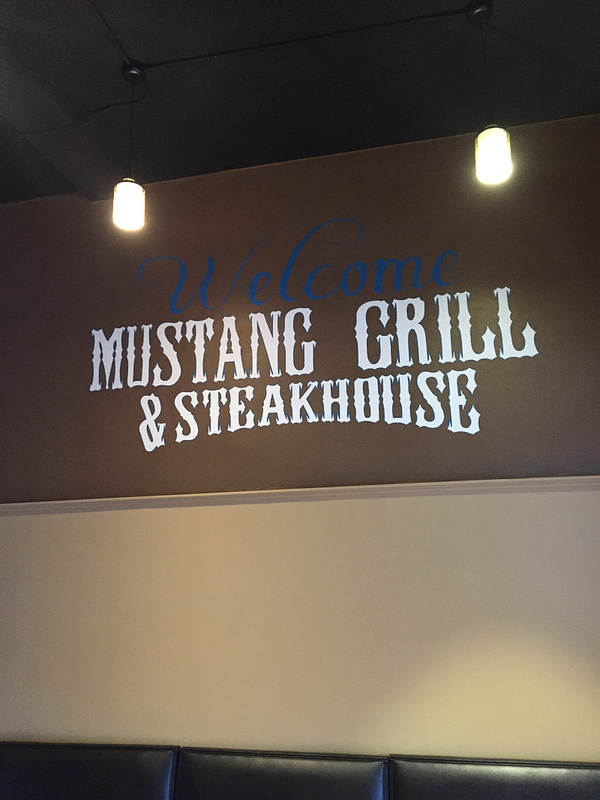 If you’ve been to Mustang Grill before, be sure to let us know about your experience in the comments! Click the thumbnails below to see more. 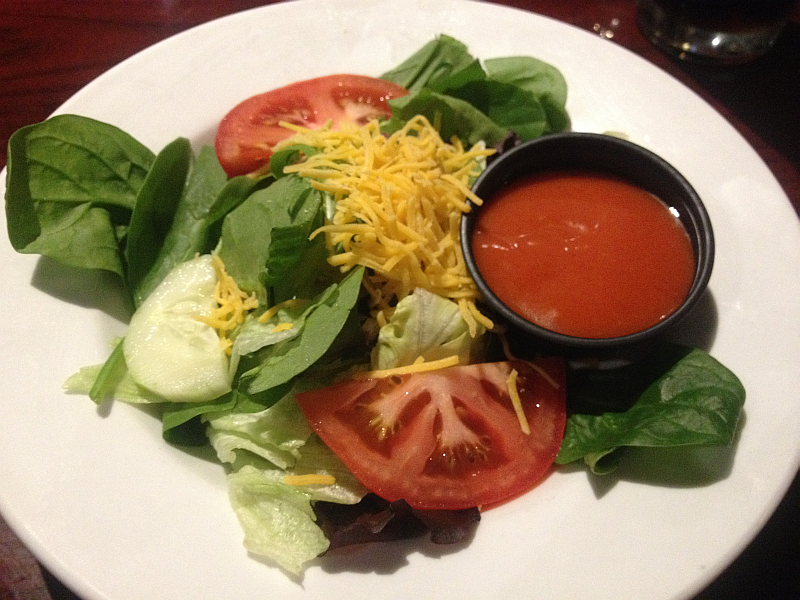 Words can’t describe how good that salad and salad dressing were! 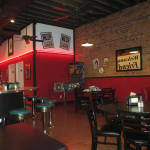 For more Kentucky restaurants and reviews, click the link. 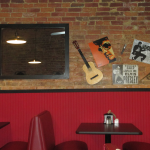 Philly’s Restaurant in Greenville… DELICIOUS! Greenville, Kentucky is a beautiful little town. It’s the sort of town you picture when you hear the words “Small Town Kentucky.” The people are friendly, the houses and lawns are well kept, well manicured, and beautiful year round.I can think of a million adjectives to describe Greenville, Kentucky – including cool. 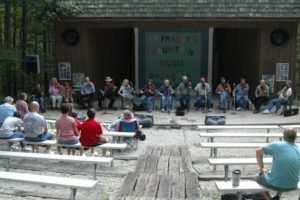 In fact, Greenville, Kentucky is one of the finalists for the title of America’s Coolest Small Town 2013 title. There are only 15 finalists left and Greenville is the only Kentucky city on the ballot. I hope you’ll click the following link and pass it along to everyone you know. You can vote once every 24 hours and I’m hoping you’ll do that as well. 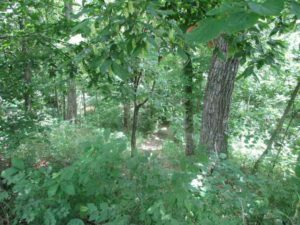 Voting only takes a few seconds, and Greenville needs a little extra love right now (when I last voted, it was in 6th place, but not very far from 4th). 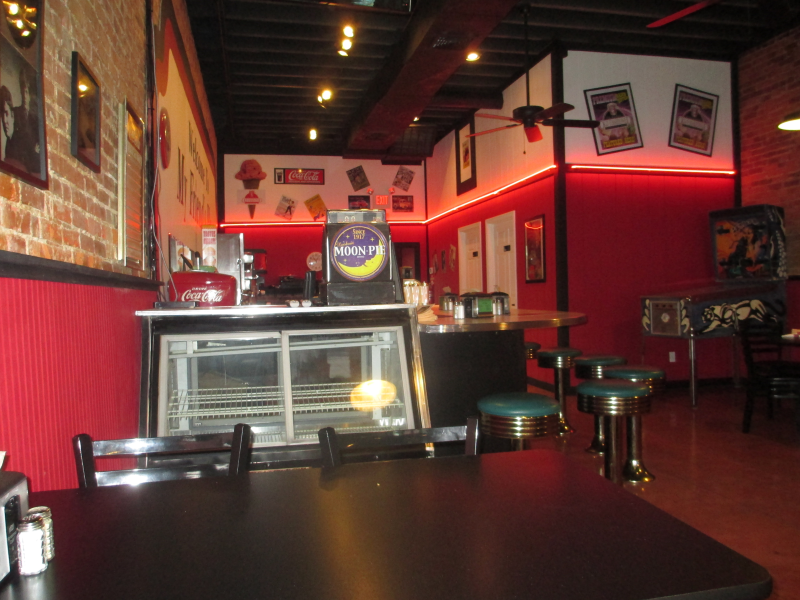 My Friend’s Place is a 50’s Diner in downtown Greenville. 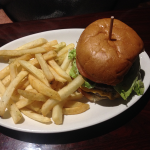 Mouth-wateringly delicious burgers! 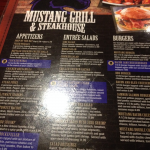 See Also: Mustang Grill and Steakhouse Review! My husband and I feel like kids on Christmas morning when we walk into a restaurant and know, right off the bat, that we’re in for something special. 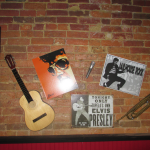 Whether we’re in Owensboro, Paducah, Madisonville, Louisville, or Grand Rivers we get positively excited about Kentucky restaurants doing things the right way. 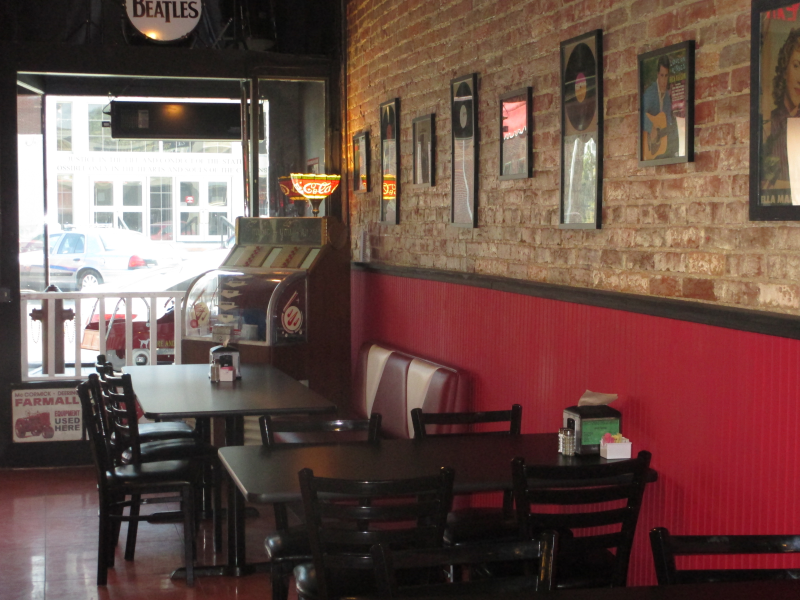 The kick we get out of these restaurants is even higher when it’s an unexpected “off the beaten path” restaurant. 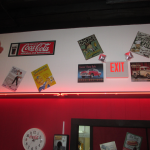 This restaurant review is about a 50’s diner in Greenville, Kentucky that could be the poster child for this type of restaurant. Michael had business in the beautiful little town of Greenville, Kentucky recently and asked if I’d like to join him. He mentioned that we’d stop at a “50’s Diner for lunch” and I believe I was dressed with my handbag on my arm before the words were even out of his mouth. That’s how I roll. 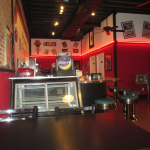 The 50’s diner in question is My Friend’s Place at 129 South Main Street in charming downtown Greenville. While charming may seem like an old fashioned word, it’s the perfect word for downtown Greenville because it, itself, feels a little like a trip back in time. Back to a time when everything was as neat as a pin and everyone waved and smiled, whether they knew you or not. We didn’t know the address for the diner, so we actually walked right past it. When burgers are on the brain, there’s little room for anything else. Michael asked for directions from a very friendly woman who pointed us in the right direction. The picture above is the cool sign you’ll see above My Friend’s Place. 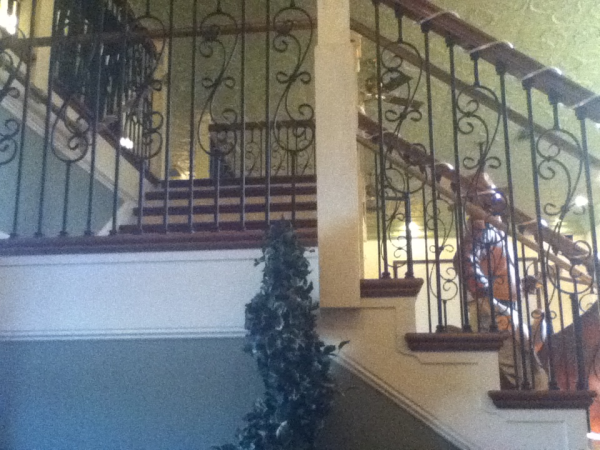 The inside of the restaurant is ab-so-lute-ly beautiful. When I hyphenate a word, I’m saying it with distinct pauses to heighten the effect. This place is ab-so-lute-ly special. 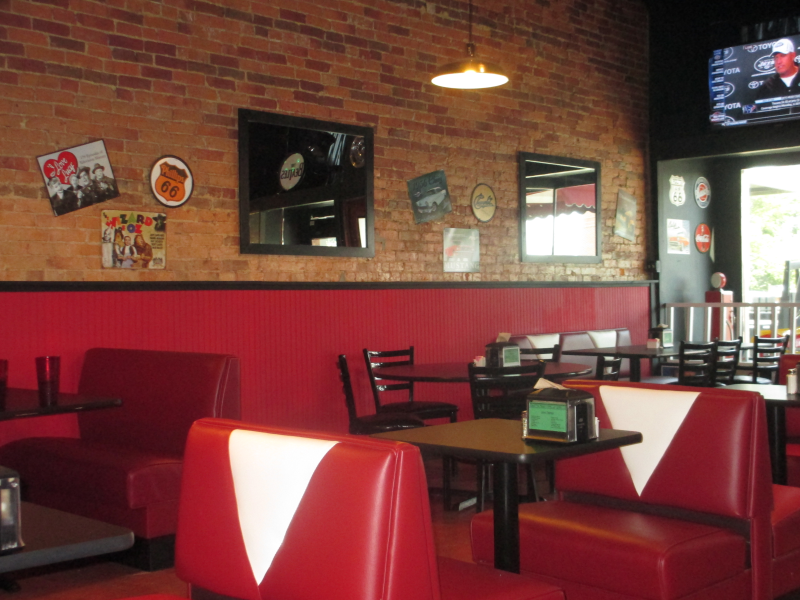 The booths, the tables, and the chairs are the coolest I think I’ve ever seen and the decor is spot on. Even the servers wear clothes you’d have seen back in the 50’s! One had on a top and skirt that looked just like clothes my mom and aunt would have worn. 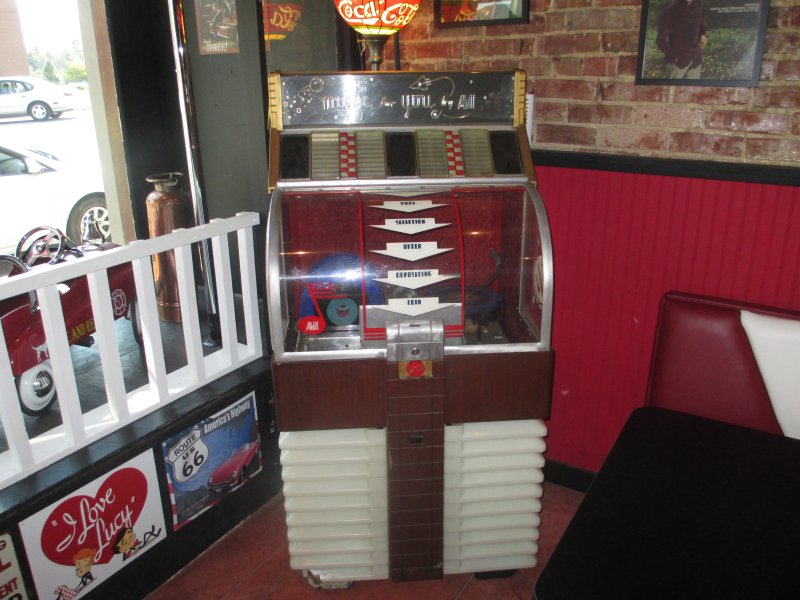 Of course the music playing was from the 50’s – a perfect touch. I fell completely in love with the ambiance of My Friend’s Place immediately. 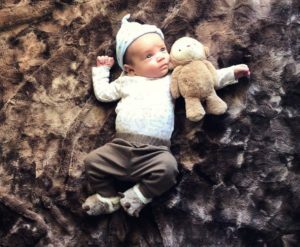 A definite case of love at first sight. But, as we all know, when it comes to restaurant reviews, you can’t judge a book by its cover or the food by the booths. After we studied the menu for a few minutes, we finally made our decisions. It was tough, though, because not only are there LOTS of choices, absolutely everything sounded delicious. The prices were also amazingly reasonable. 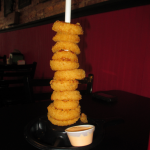 Knowing my obsession with Onion Rings, Michael ordered the Hula Hoop Rings (pictured at the top and below) for an appetizer. When reviewing onion rings, I put them through a little test: I try a bite without anything on them. 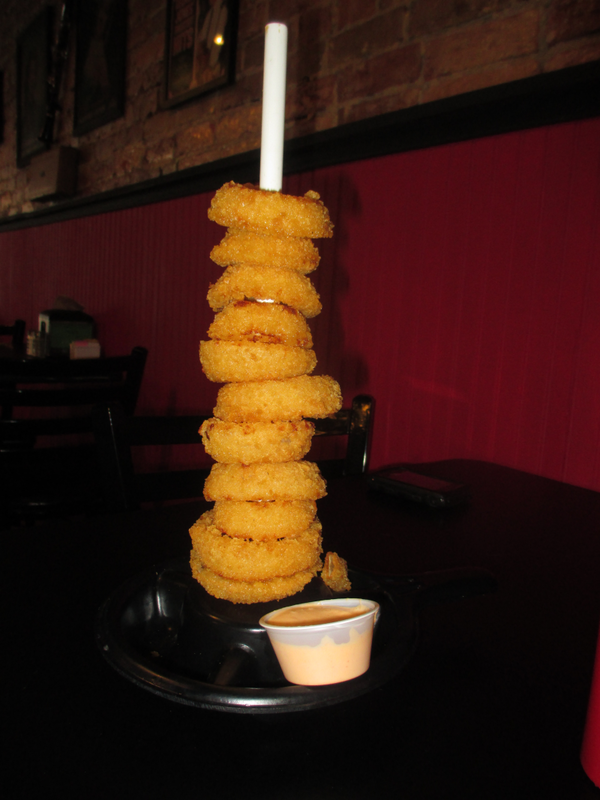 If the rings “stand up” to the test – meaning they’re awesome even without ketchup or sauce, they receive a perfect 10. The onion rings at My Friend’s Place sailed right past the number 10. Last time I checked, they were still going. These are best onion rings in all of Kentucky. There I said it. While these rings are perfection – even without the sauce – the sauce, itself, is so good that you wouldn’t dare neglect it. The combination of these delicious rings and the creamy sauce was just Heavenly. I gotta admit, I’m also crazy about the presentation. Seriously, how cute is this? In what was an amazingly short amount of time, our adorable server brought our meals to the table. 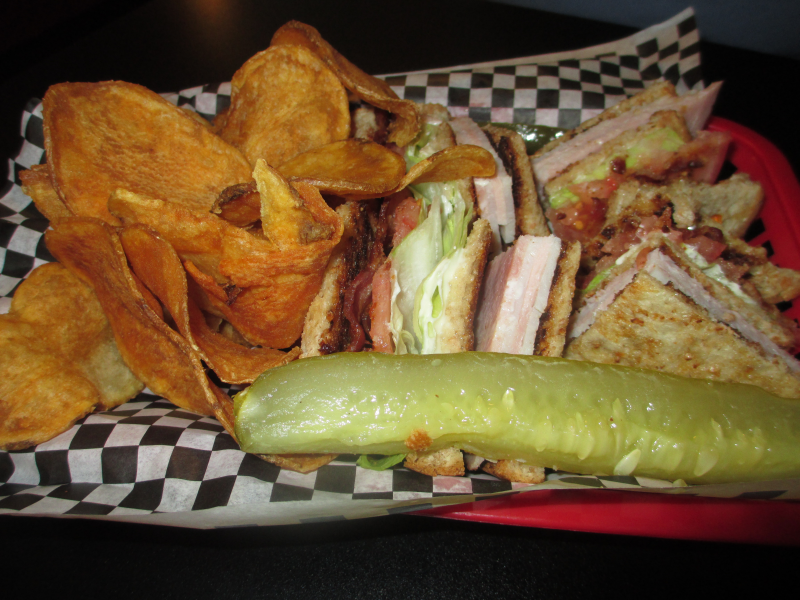 My husband’s Club Sandwich looked so great that I almost regretted my own decision. 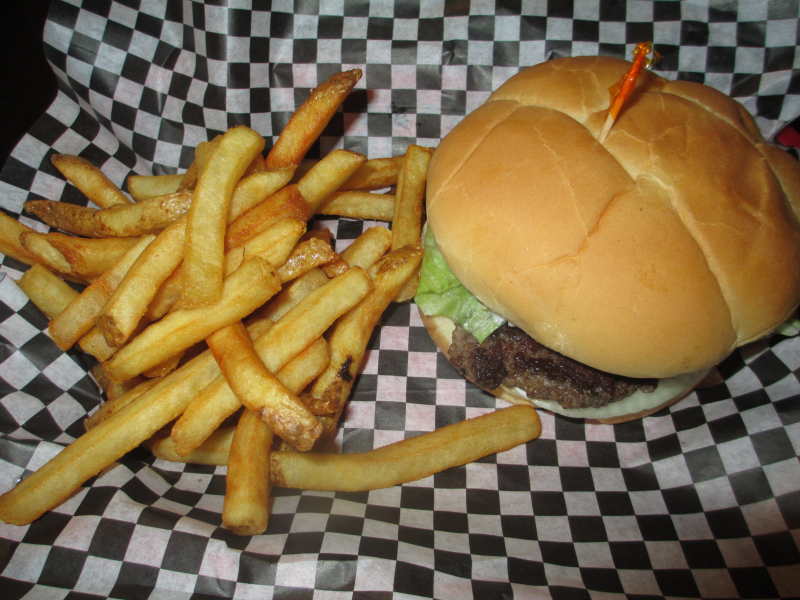 That is until I caught site of the gorgeous steak burger and fries. 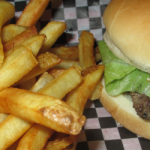 One bite into the juicy, flavorful steak burger confirmed my suspicions… the girl made the right choice. De-li-cious! 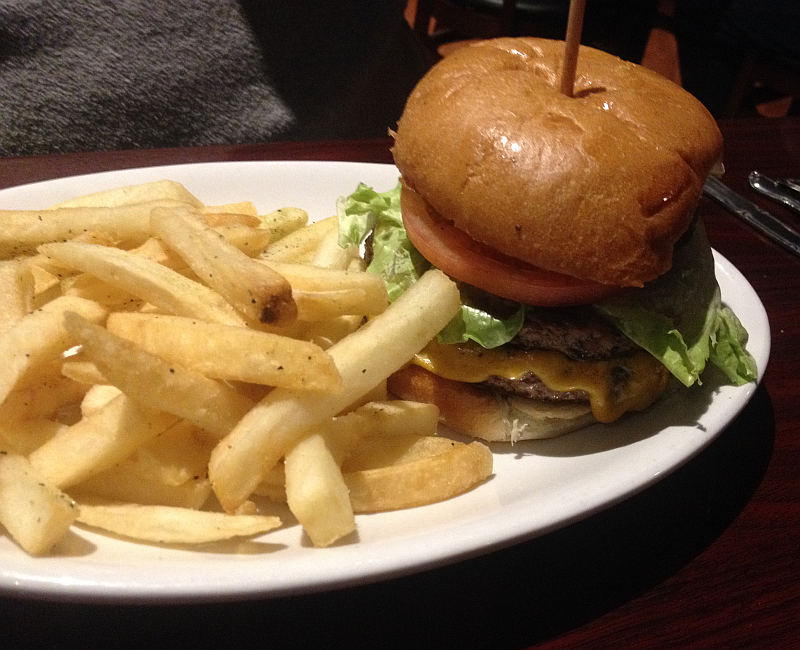 Michael took a bite of the steak burger and said, “Now that’s how a burger’s supposed to taste.” Dang right it is. How can words even hope to describe such deliciousness? Everything we had was simply outstanding. 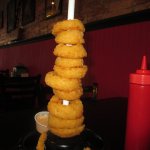 The best onion rings in the state? Check. The best burger I’ve had in, like, 700 forever’s? Check. Onion ring sauce so delectable you could scoop it out and eat it with your fingers? Check. Fries that you throw in so fast that you almost forget to breathe? Check…. gasp… check. 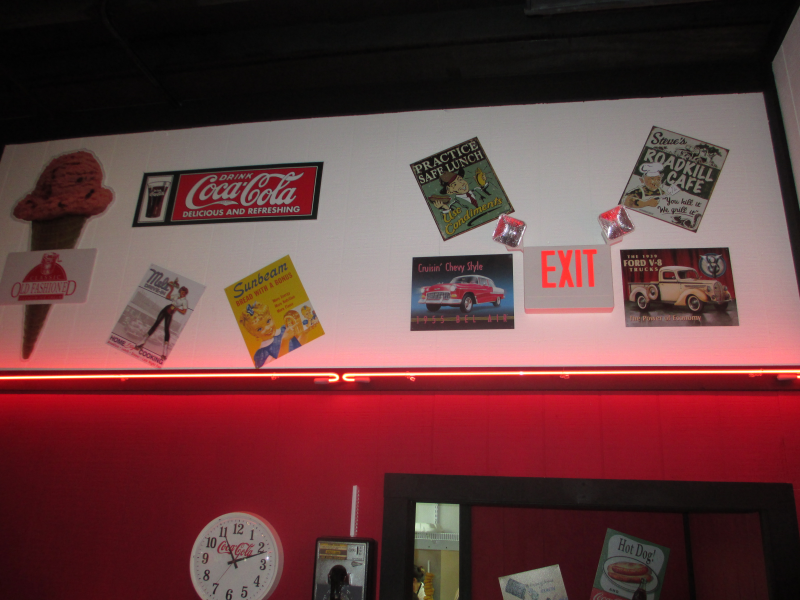 ALL in a diner that’s so cute you never want to leave. 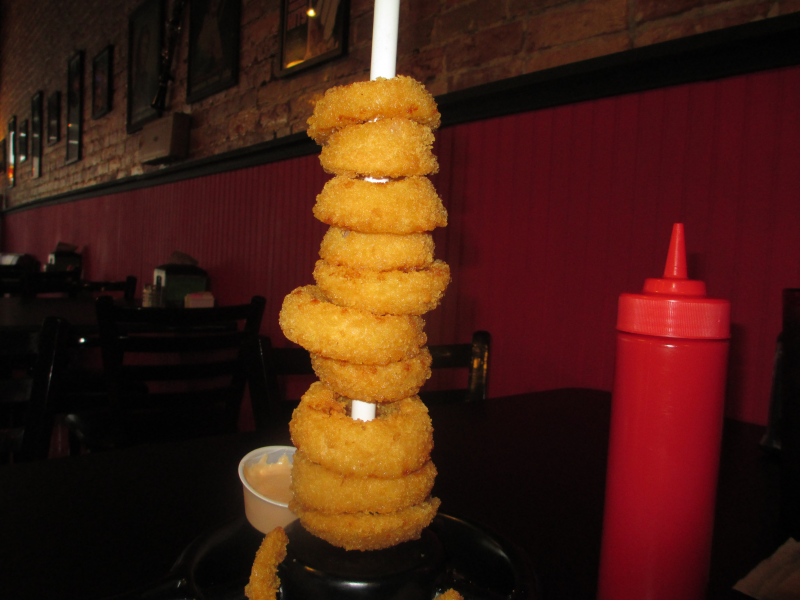 I’m afraid that Michael and I both filled up on Onion Rings (did I mention they were the best in Kentucky??? 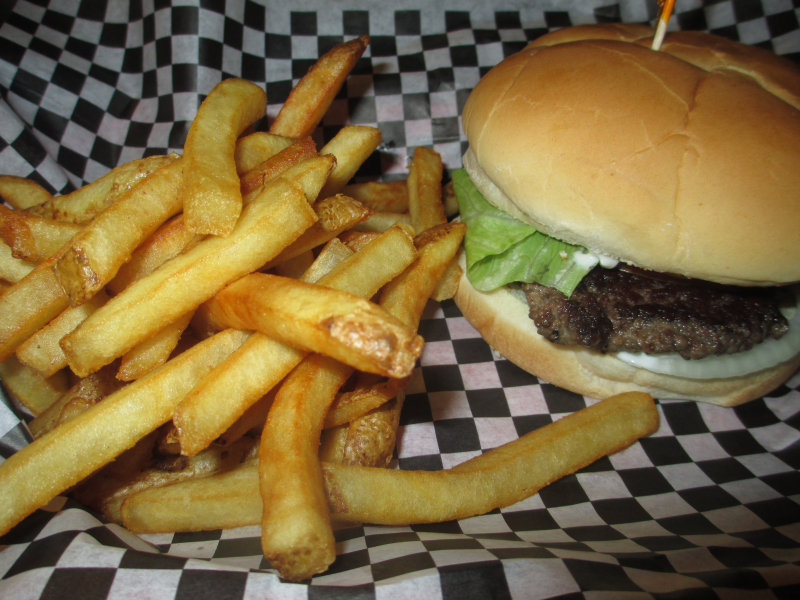 ), fries, burgers, and club sandwiches. We didn’t have any room for dessert, even though their hand dipped ice dream looked like something out of my sweetest dreams. Rumor is it’s the best ice cream in the world and I am not about to question it. We’ll save room for it next time. Mark it down. 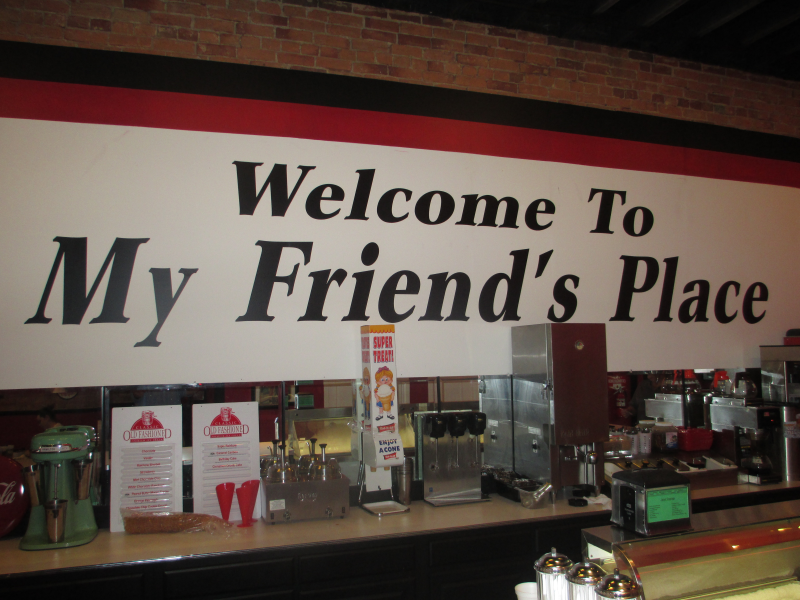 My Friend’s Place is located at 129 South Main Street in downtown Greenville, Kentucky. 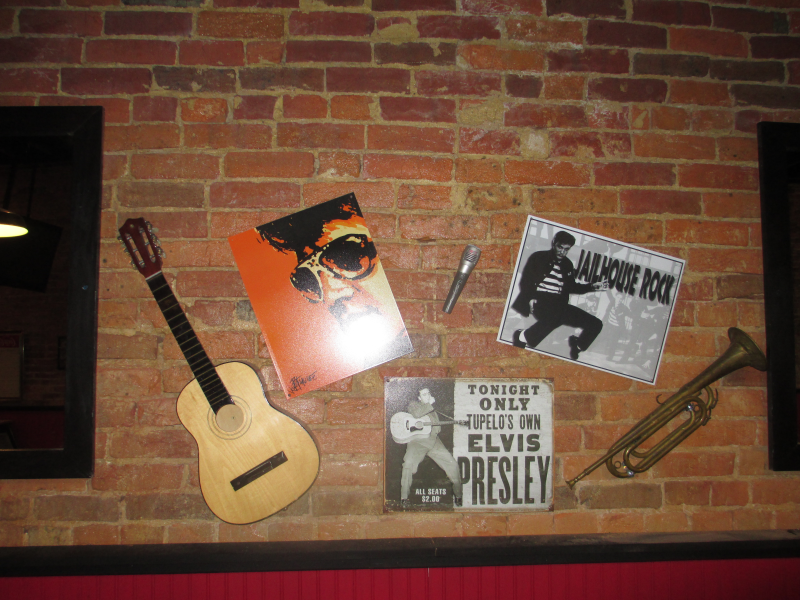 The best onion rings, steak burgers, and the King of Rock and Roll are all waiting for you. Doing Kentucky Restaurant Reviews is one of my favorite things to do. Fortunately, Kentucky is covered with outstanding restaurants, so it makes my job even more enjoyable. 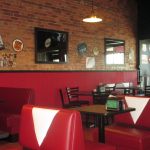 Some of these restaurants are nationally known chain restaurants and others are little known, locally-owned restaurants. 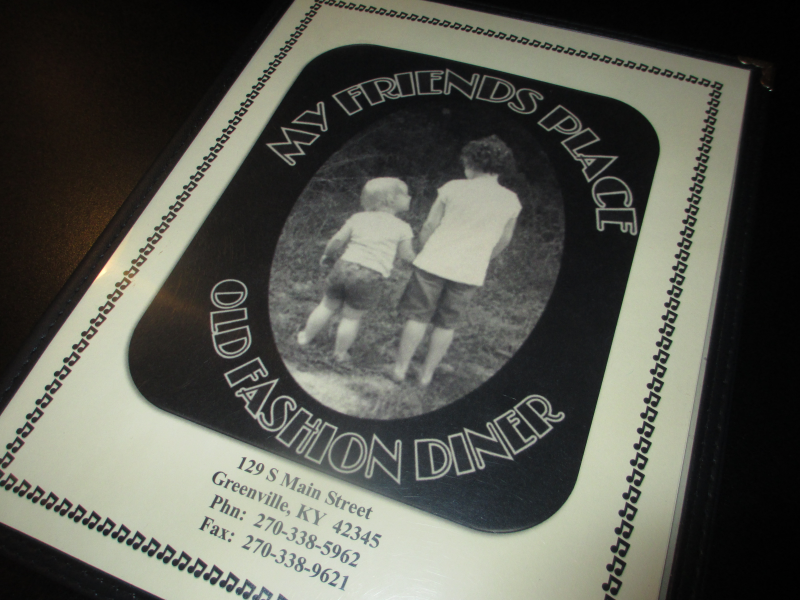 I love all types of restaurants, but these “off the beaten path” Kentucky restaurants are extra special. 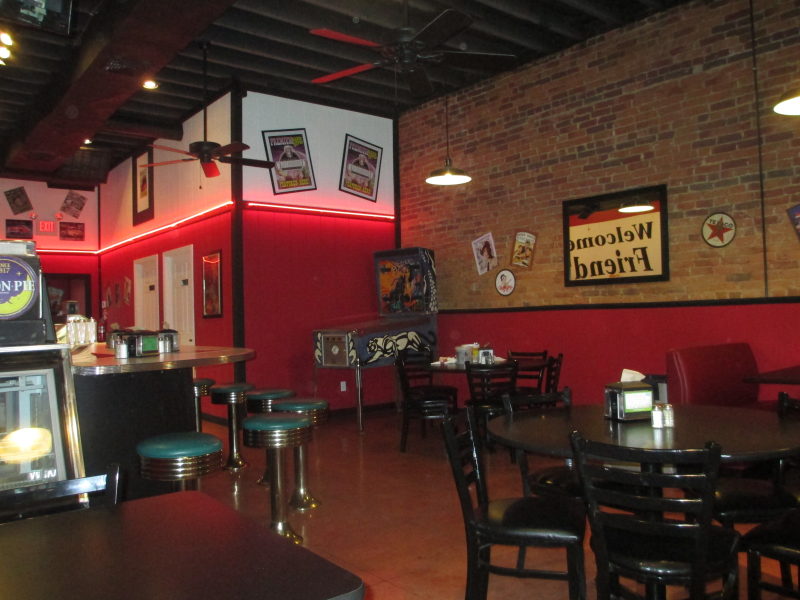 The restaurant reviewed here, Philly’s in Greenville, Kentucky may not be on the “beaten path,” but rest assured, once you’ve been there, you’ll beat a path to get back. Okay, suffice to say EVERYTHING. You’ll find yourself just looking around, not wanting to miss anything. Small towns in Kentucky never cease to amaze me. 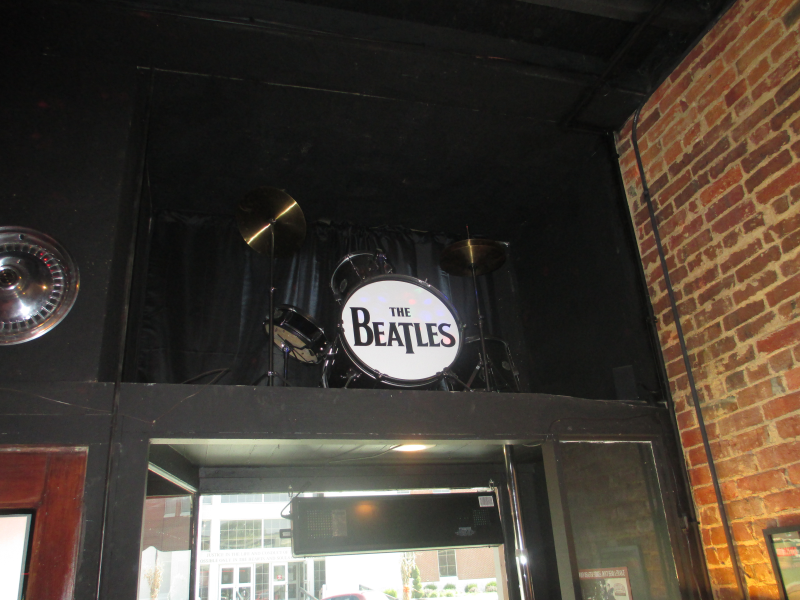 Several times throughout the meal, as I looked around the restaurant, I thought, “This is the sort of restaurant you’d expect to see in Louisville, Lexington, Owensboro, or Bowling Green…” Yet, here we were in quite, comparatively small Greenville, Kentucky. 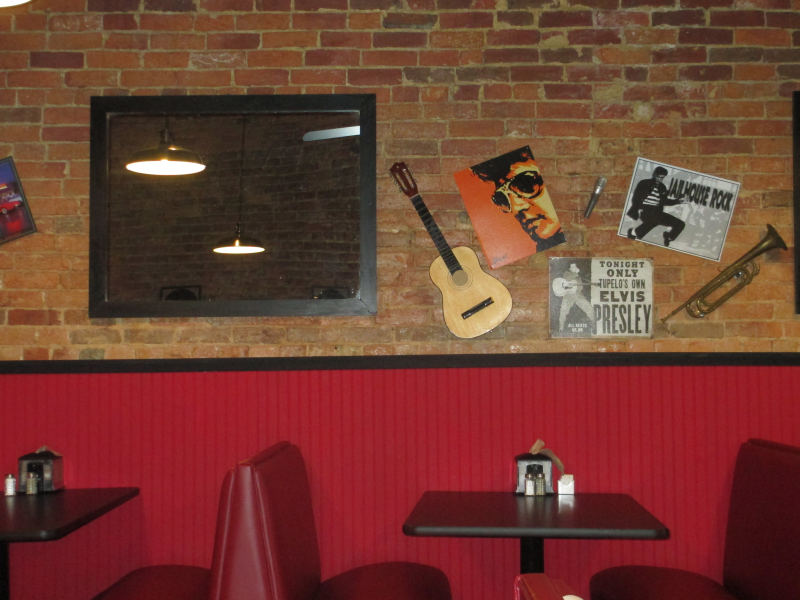 Truth be told, any restaurant we’ve ever visited in Greenville has been uncommonly good. What is it with this town?!?! Philly’s makes me think that the people in Greenville take great pride in what they do and how they do it. This is one very special restaurant and, quite frankly, I can’t wait to go back. 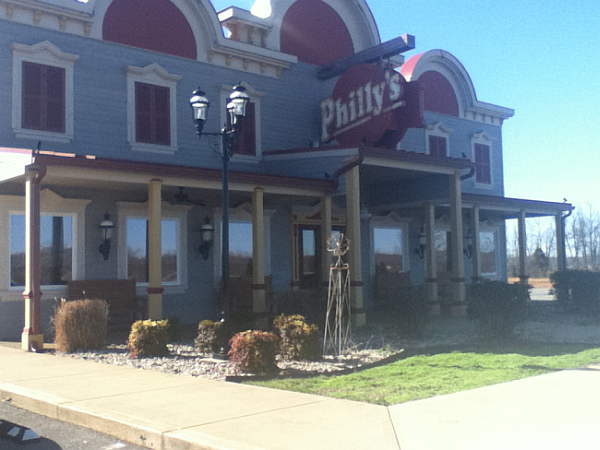 My jaw dropped when I saw the beautiful outside of Philly’s, but when we walked in, my knees nearly buckled. Beautiful just doesn’t seem to cover it. 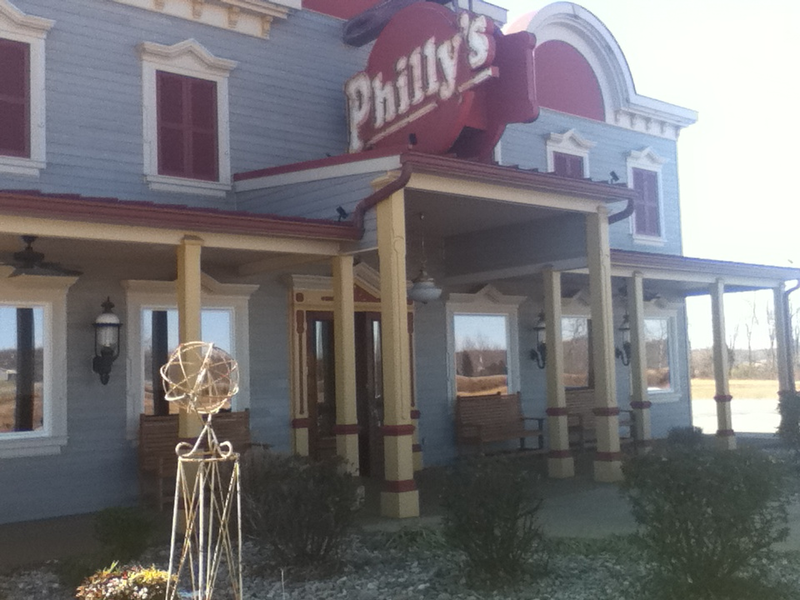 We were at Philly’s Restaurant at lunchtime, but the restaurant also serves dinner, which no doubt is equally amazing. I can’t wait to go back and order off of their dinner menu. 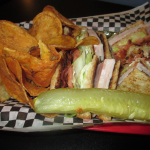 If it’s half as good as the lunch, you can look forward to many more reviews. Because of the unseasonal, yet glorious, sunshine we’ve been enjoying in Kentucky the picture above isn’t as clear as I’d like it to be. This beautiful statue is John Wayne on a horse and it is really amazing. The likeness was incredible. All of the decorations were gorgeous. The time and money spent on this very special restaurant is obvious. 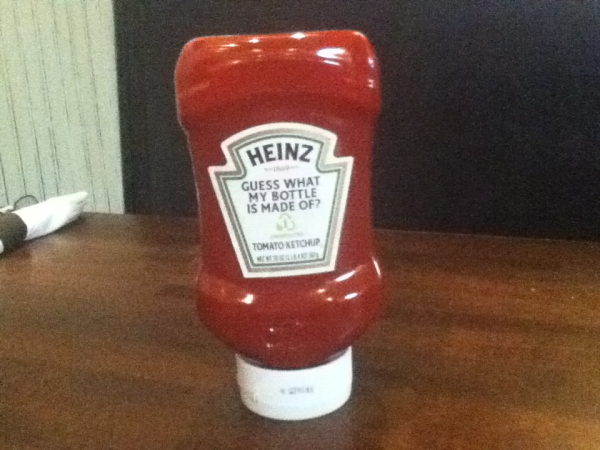 Just as I was thinking, “They seem to do EVERYTHING right…” I noticed the bottle of Ketchup on our table, Heinz! 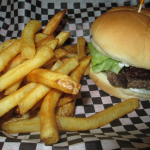 If you read my restaurant reviews, you know a pet peeve of mine is nasty ketchup. If it’s not a brand you’d see in Kroger, guess what – it’s probably a major cheapie and tastes like it. When I see Heinz ketchup in a restaurant, it tells me that the owners of the restaurant have enough pride in what they do and enough respect for their customers to give them the best. I appreciate that! As the Onion Ring Queen of the South (a self-given yet very earned title), I use ketchup often and nasty, cheap ketchup makes my toes curl – and not in a good way. That was before I tried Philly’s coleslaw. Words can’t tell you how extraordinary this coleslaw is. 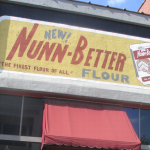 I can’t for the life of me figure out what they did to it (and I’m an avid cook! ).Ã?Â It’s the best coleslaw I’ve ever had in my life and if I had the recipe I’d make it every single day for the rest of my life. It’s not just good, it’s stupid good. It comes served in a beautiful little dish because.. well, because they do everything right, that’s why. Notice the crackers are also name brand? Would you expect less? Something I was somewhat surprised to see (after seeing just how gorgeous everything was) were the prices. They were extremely reasonable. I honestly expected them to be higher. 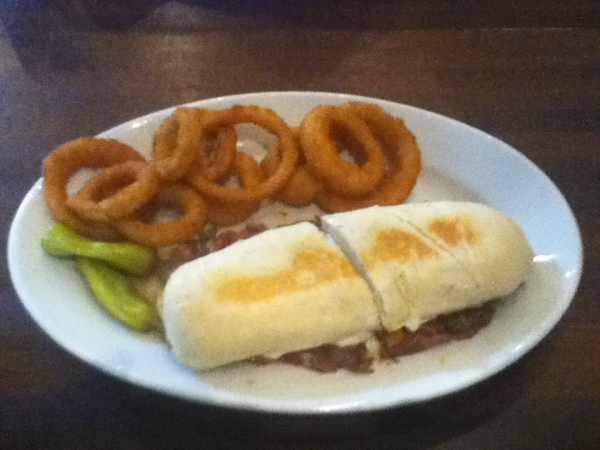 My husband, Michael, had the Italian Beef and I ordered the Pulled Pork BBQ Sandwich. We both had onion rings, which was a great call. 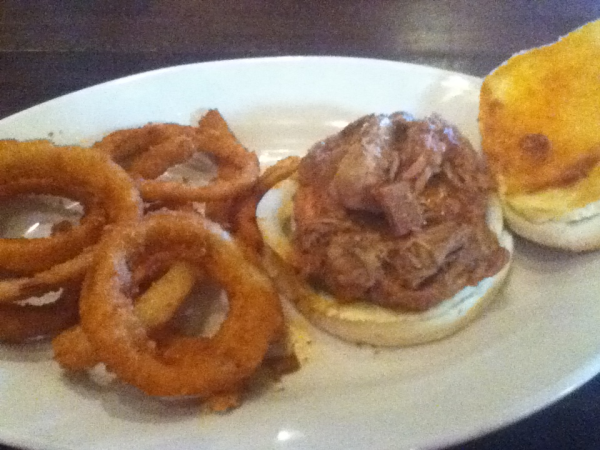 The pulled pork was outstanding. It tasted like pork you’d expect to find in a BBQ restaurant – smokey and mouth-watering delicious. From the way my husband devoured the Italian Beef, it must have been equal to the pulled pork! 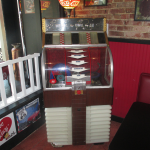 Unfortunately, we had places we had to be, so we couldn’t just lie down in the booth and wait for supper. 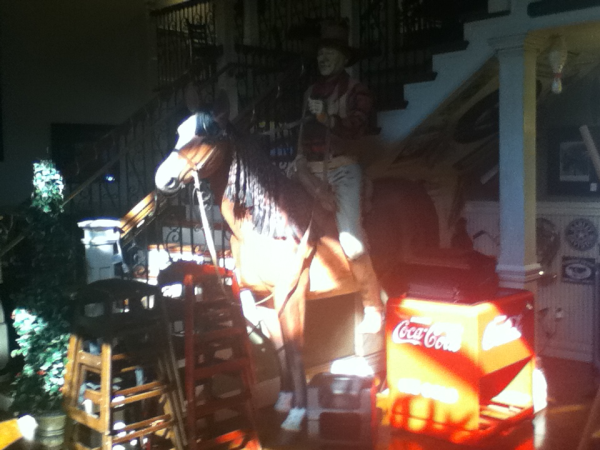 So, we had to leave – but I made a solemn promise to The Duke (and to his horse as well) that’d we’d be back soon….. Crummy sides. I hate for a restaurant to rest on the laurels of their meat and/or main dishes. If it’s on your menu, it should be able to stand on it’s own, as if it were the ONLY thing on the menu. Unfriendly servers. 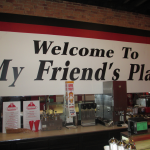 If you read a restaurant review on Genuine Kentucky and the server is not mentioned, rest assured that they either weren’t very friendly or weren’t exactly on the ball. Or both! Unfriendly hosts and hostesses.Ã?Â Hello? !Ã?Â You’re paid to be friendly. Your job exists to welcome visitors and make them feel like you’re glad to see them. Overcooked fries.Ã?Â Come on, take them out before they’re brown.Ã?Â Brown fries aren’t cool. Watery soft drinks. Servers should be taught that if you see the beverage come out of the machine and there is NO fizzle, DO NOT serve it to the guests. Blech. Servers who “Push the Wrong Button.”Servers charging the wrong price for menu items is becoming an alarming trend. A server can get annoyed with a customer and, bam, “accidentally” hit the wrong button.Ã?Â A word to anyone who eats out: Examine your ticket. For example, if the restaurant offers 1/2 off Sushi, make certain your server doesn’t charge you the full price. I am, by nature, a very friendly guest when I visit restaurants.Ã?Â I always, always leave tips.Ã?Â When the service is good, I don’t just tip, I over tip! 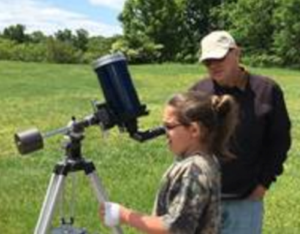 My oldest daughter is the same way. One sweetheart of a server in Olive Garden once got a $10 tip from us for lunch.Ã?Â She made us smile, so we wanted to make her smile. It’s really as simple as that. 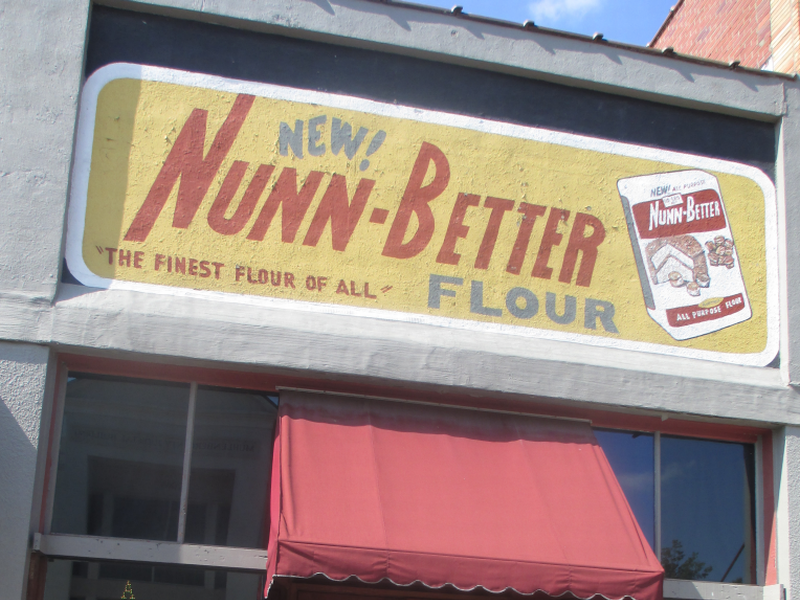 Real butter is always better than Margarine. Options, Please.Ã?Â As someone with a vegetarian daughter, I love for restaurants to offer completely meatless dishes.Ã?Â Bonus points for the restaurants, like Denny’s, with Boca Burgers on their menu. 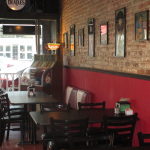 One final thought: If an owner really wants their restaurant to be the best it can possibly be, he or she should have comment cards on the tables. Guests will tell them what they’re doing right but, more importantly, they’ll tell them where they’re messing up.Ã?Â A closed, secure box should be provided for guests to put the cards in. Get the opinions from the people who’s opinions matter most.